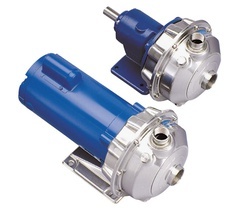 The Series NPO embraces a line of 1", 1¼" and 1½" NPT discharge, general liquid transfer and booster pump application end suction centrifugal pumps. The liquid end construction is of AISI 316 stainless steel, stamped and welded. Open vane impellers are ideal for liquids with suspended solids to 3⁄8" diameter. The NPO (or open impeller NPE) was developed as a result of Goulds Water Technology experience with the commercial dishwasher market. In addition, it builds on the strength of our NPE market presence and allows us to enter other high volume markets where small solids or particulate handling is required. The exclusive Goulds Water Technology fabricated stainless design also offers considerable advantages over our major competitors in these markets. The NPO pump from Goulds Water Technology is an open impeller, single stage, end suction centrifugal made of 316 stainless steel for a variety of commercial washing applications. It consists of three pump sizes using 1⁄2-71⁄2 HP motors in a variety of enclosures. Many of the options for the NPE including seals and the vent/flush accessory are also available for the NPO. The casing is a modification of the NPE casing which incorporates a flat running surface for the front of the open impeller. The impeller for the smalles size is a cast 316 open design similar to that used in the ICS. Impellers for the two larger sizes are fabricated 316L. The seal housing and seal are identical to those used on the NPE. 5.0625" or 5 1/16" & ""
5.25" or 5 1/4" & ""